The Iowa Articles of Incorporation Domestic For-Profit Corporation are required to be submitted to the Iowa Secretary of State whenever an entity wishes to incorporate as a for-profit corporation in this state. This form template delivers the basic minimum requirements expected by the Iowa Secretary of State. Different entities will need to report different specifics regarding their corporation. For instance, a professional corporation will need to make sure its licenses are in order or a regulatory board is satisfied with its qualifications or a corporation who has divided its stock into classes will need to define those classes. Incorporators are expected to be fully abreast of all such requirements by the State of Iowa and should, in fact, seek legal counsel if any part of the process for incorporating the entity type they wish is unclear. There are some very basic specifics that must be reported in all cases. Some examples would be the Name of the corporation, its Principal Address, its Registered Agent, Directors, and Incorporators. All such articles must be signed by the Incorporators of the entity. 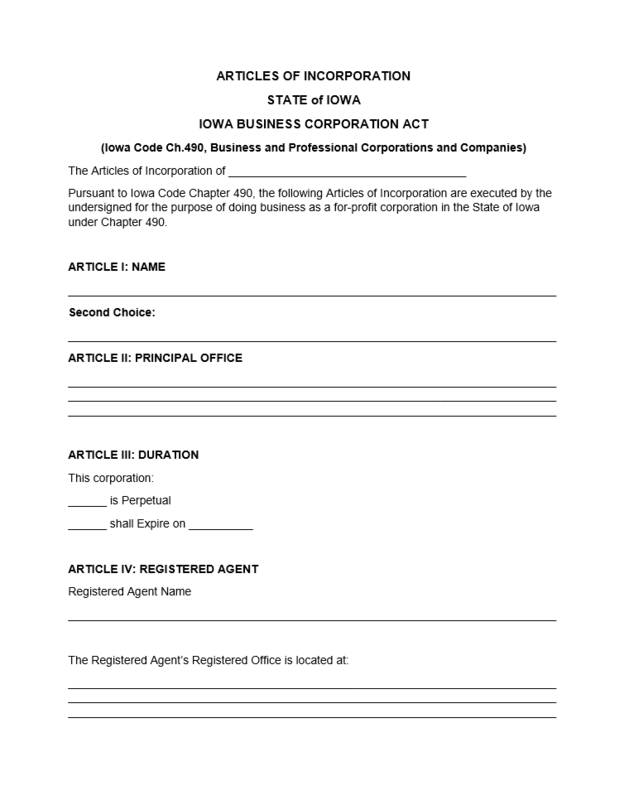 The Iowa Articles of Incorporation Domestic For-Profit Corporation should be submitted before the corporation operates as such in the State of Iowa simultaneously with all required paperwork for this entity and a Full Payment of the Filing Fee ($50.00). You may mail this to Secretary of State, First Floor, Lucas Building, 321 E. 12th St., Des Moines, IA 50319. Step 1 - Select the link above to download the Iowa Articles of Incorporation Domestic For-Profit Corporation. This may be edited by a PDF program or printed then typed. Step 3 - Next, in “Article I: Name,” report the Full Name of the corporation on the space provided. This should be the exact Name you wrote above. If you did not reserve the Name with the Iowa Secretary of State, there will be a line labeled “Second Choice.” You may enter an alternate Name here in case the chosen one is taken. Otherwise you may leave the second choice line is blank. Step 4 - In “Article II: Principal Office,” report the Full Address of the Principal Office’s location. This may not contain a P.O. Box. Step 5 - In “Article III: Duration,” indicate if this corporation will operate without a termination date by placing an “X” in the first space. If a termination date is to be set, place an “X” on the second line then enter the Date of Termination in the space provided. Step 6 - In “Article IV: Registered Agent,” enter the Full Name of the Registered Agent. If this is an individual, this must consist of the First Name, Last Name, and any Middle Name on record. If this is a business then enter the Full Name of that business. Do this on the first line of this section. Step 7 - The second area of this section will require the Full Address of the Registered Office of this Agent entered on the blank lines below the words “The Registered Agent’s Registered Office is located at:.” This must where the Registered Agent may be physically found and may not contain a P.O. Box. Step 8 - The top of the next page will provide an opportunity to report the Mailing address of the Registered Agent should the Registered Agent have a separate address where he/she/it receives its mail. You may leave this blank if the Registered Agent receives mail at its physical location. Step 9 - In “Article V: Incorporators,” provide the Name and Address of each Incorporator. A table has been provided for this however if there are more than four Incorporators, you will need to attach a full listing of these parties and each one’s address on a separate document that is clearly labeled. 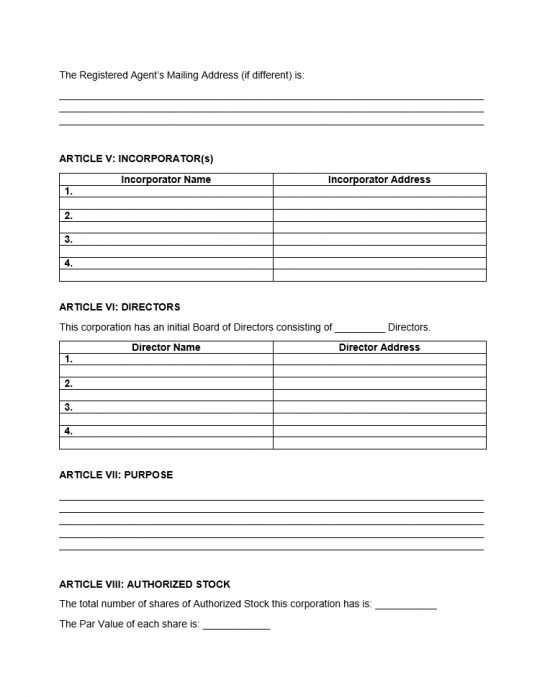 Step 10 - Next, in “Article VI: Directors,” report how many Directors will be serving on the initial Board of Directors on the blank space in the first line. Then using the table provided, enter the Full Name of each Director in the left column and the Full Address for the Director named in the second column. This, too, must be a complete roster and may be continued on a separate sheet of paper. Step 11 - In “Article VII: Purpose,” define the Purpose of the corporation being formed. Make sure to make this a complete report as to why this corporation is forming and how it will operate in the State of Iowa. 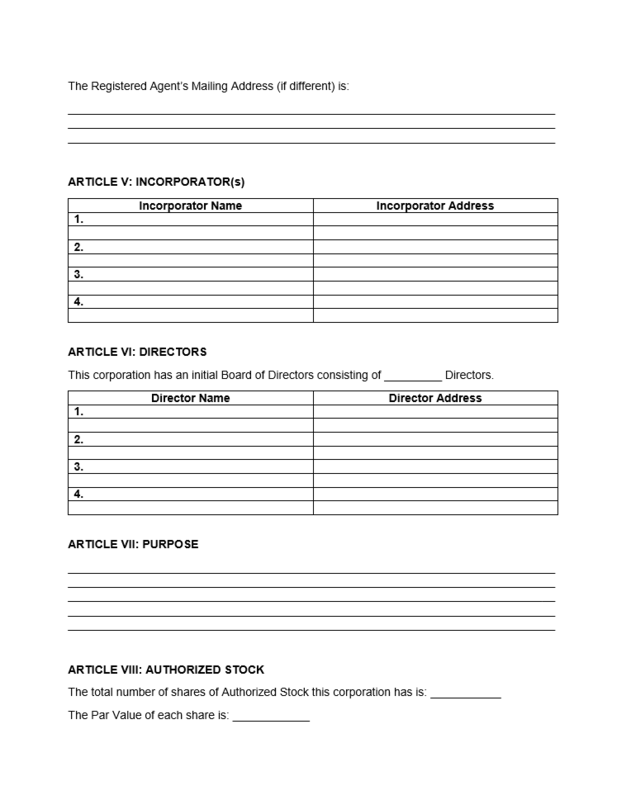 Step 12 - In “Article VIII: Authorized Stock,” enter the Total Number of Shares authorized for this corporation on the blank space in the first line. Then on the second line, report the Par Value for each share. If this corporation has divided any shares into Classes and Series, you must report the total number of each along with the Par Value of each share in each Class. Step 13 - In “Article IX: Provisions,” report any conditions, provisions, or amendments that must be stated for this corporation’s formation. Step 14 - On the blank space on the line starting with “I, the undersigned…,” enter the Date this document has been completed. 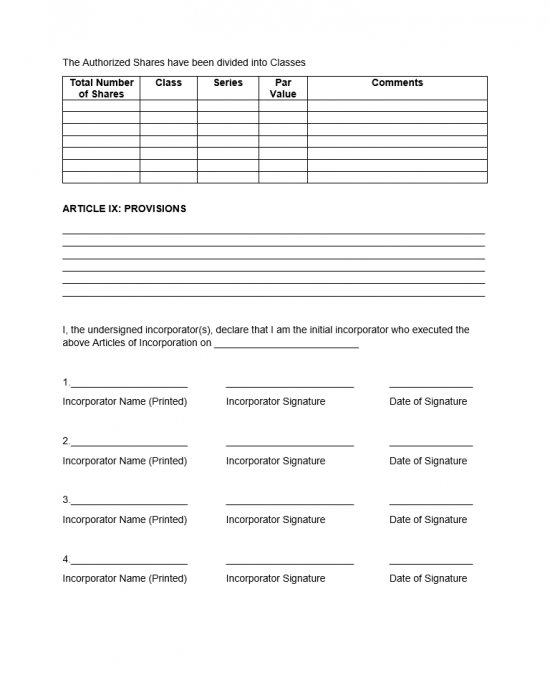 Step 15 - The last area of the Iowa Articles of Incorporation Domestic For-Profit Corporation will contain a blank space for each Incorporator to Print his or her Name, a blank space for a each Incorporator to Sign his/her Name, and a blank space for that Signing Party to document the Date of Signing. Each line may have one Incorporator. Each Incoprorator listed in Article V must provide these items. If there is not enough room, you may continue the Signature area on another sheet of paper with these items and attach it. This must be clearly labeled. Step 16 - You should take a moment to double check that all the information is reported accurately. Additionally, you should make sure all required documents are present and accounted for. Once this is done, you should make a copy of the Iowa Articles of Incorporation Domestic For-Profit Corporation (this must be an exact copy). Send two copies of the articles, all attachments and a check payable to the Secretary of State in the amount of $50.00 (Filing Fee).